Options for Friday used to include catching up with work mates after work at the pub ‘for a drink’, friends who live locally ‘for a drink’ or at home for ‘a few quiets’. In retrospect, it was SO pathetic how everyone (myself included 🤦🏽‍♀️) understated these occasions. WHY did we always say ‘a drink’ or ‘a couple of quiets’?!?! We always downplayed it. I think I did it to sound like I was in control of my drinking. I think I wanted to sound civilised, social and in control. Sound like an enticing and fun evening? No. But that was typically how Fridays used to play out for me. It was seldom the one or two drinks that we initially framed the evening as being. What’s worse is that I wasn’t doing this alone. We all went past the one to two drink point together! And it was totally acceptable. Many friends (and many who I continue to hang out with and love dearly) still do this. And that’s OK – it’s their business, it’s their life. They can do what they want and drink how they want. I just know that I’m not that person anymore. These days, I cook a yum dinner or we’ll have a kicked back evening. Sometimes I’ll do a Friday night hot yin yoga class – the ideal way to close out the working week. 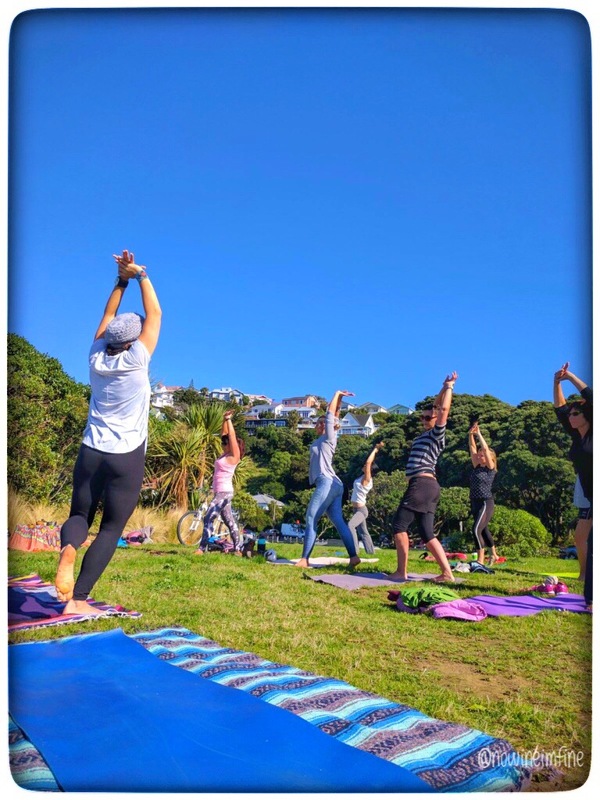 And sometimes, if the weather is good, there are outdoor yoga classes in the weekend. Here are some photos from one of our recent classes. It’s a total thrill. A million times better than lying in bed, feeling pathetic with a pounding hangover. I love my new life. And I trust you are loving your new life too. It’s a blessing that I wouldn’t change for the world. Isn’t exercise so wonderful . Releases toxins from your body … Yoga especially … I do more cardio but would like more calming .. It so beats a awful hangover . Rock on sister down under ..
Cardio is also brilliant – especially for a good night’s sleep! Interesting, I didn’t know that! 😀 x Have a great weekend too! My favorite Friday nights are now walking around one of our beautiful lakes with hubs, picking up something yummy to eat. I am so happy you are doing all the right things here! Sounds like a lovely Friday night – so many joys nature offers us. How fab! I’ve never done yoga, although I’ve considered it many times. I don’t think they do outdoor yoga in Scotland. There’s probably a good reason for that though (seasonal reasons). this post made me so so so happy. oh man, i used to dream about friday night drinks with friends. in fact, it usually just morphed into the entire weekend being drunk and then trying to get it together monday, only to try to calm my hangover with some light drinking monday night…and so on from there….eeeeee…it feels so nice to have weekends without drinking, right?! and your outdoor yoga sounds dreamy!!!! Yes yes – what were we doing to our mind and bodies! Sooooo much better.